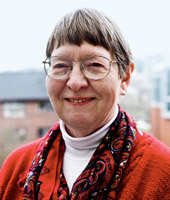 Mary Fry has retired after 40 years at SPU. In an age when the U.S. Department of Labor expects the average person to change jobs every four years, Associate Professor of Nursing Mary Fry’s 40 years of service at Seattle Pacific University is an extraordinary statistic. In addition to her leadership in SHS and SPU as a chair or member on countless committees, Fry was active beyond Seattle Pacific’s borders. She spent more than 12 years on the Wallingford Childcare Board, volunteered with both the March of Dimes and the American Cancer Society, and participated in many professional organizations, including the Association of Women’s Health and the National Council on Family Relations. And she had published in multiple textbooks on the subject of reproductive function. What has a life devoted to nursing taught her? Fry puts it this way: “I sometimes hear the world through and beyond what has been said.” As she heads into retirement to enjoy her 40 rose bushes, her grandchildren, and her quilting, many will miss Fry’s ability to hear the unspoken needs she has so ably met at SPU.